McIntosh MA6600 is wise choice of music lover because it comes with 200 watt, fiberoptic volume control, electromagnetic nitrogen sealed switches, Illuminated LED power meters and power control output and many other rich features. 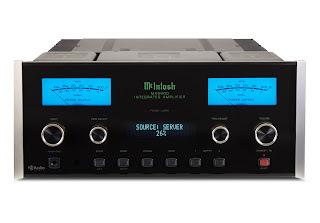 The ability to accept an optional tuner module enables the MA6600 to become the first stereo receiver offered by McIntosh in over 15 years. Power Output: 200 Watts Minimum per Channel at 2, 4, or 8 Ohms. Sound to Noise: Preamplifier: 92dB, Phono: 84dB, Power Amplifier: 115dB. Dimensions: HxWxD 7 5/8" x 17 1/2" x 22" 75lbs.